One Saturday I was changing a poopy diaper and I decided that I wasn’t going to do it anymore. I told Maximus he was going to wear underwear and he said no. I went and made lunch and he followed me around the house asking for a diaper. After 20 minutes, he got tired of asking and brought me a pair of underwear. And that’s how our second and finally potty training adventure started. It was a little too spontaneous, but it worked for us. I didn’t think about naptime being just around the corner or how Bryan and I were going to be at a charity event that night and he was going to be with my in-laws for the evening. But, we quickly made the rule of only wearing diapers when he sleeps and he did really well with my in-laws. In hindsight, I should have talked to him on Sunday evening and told him he was going to wear underwear to daycare too. Since I wasn’t sure when we put him to bed, I didn’t say anything. Monday and Tuesday mornings were a little difficult. He cried and wanted to wear a diaper. As with any other toddler fit, we somehow convinced him (or Bryan may have PUT them on). In the past three weeks he’s had a handful of accidents. One in the car on the way home from daycare. A few at daycare and a couple at home. For whatever reason, he’s being a little stubborn at daycare. I’m not sure that he’s told her any time he’s had to go and in turn spends a lot of time “trying.” He’ll figure it out (or stop being stubborn) eventually. For the most part, he tells us when he has to go. We’re still forming habits so we remind him when he wakes up and after he eats. We transitioned him pretty quickly from his little potty to the regular toilet because that is what he uses at daycare. She taught him how to push a stool over to the toilet and get up there on his own. He’s had to do it a couple of times by himself at our house if I’m busy with Quinten. It’s weird to see him do that. He may seem a lot bigger since we had Quinten, but he’s still my little boy! We’ve been doing normal things, going on long car rides, going out to eat, and going over to friends’ houses. He done awesome in all those places and hasn’t had an accident! I’m looking back on this experience and still a little shocked that we potty trained him. Other than that one weekend in November that we actually tried, we’ve put him on his potty before baths and other random times. When I told him I wouldn’t put a diaper back on him, I didn’t actually think I’d potty train him that weekend! I’m fairly certain that it was 90% him being ready and only about 10% of our technique. It was so much different this time compared to when we tried previously. I credit all of that to Maximus and being mature enough to understand what was going on. 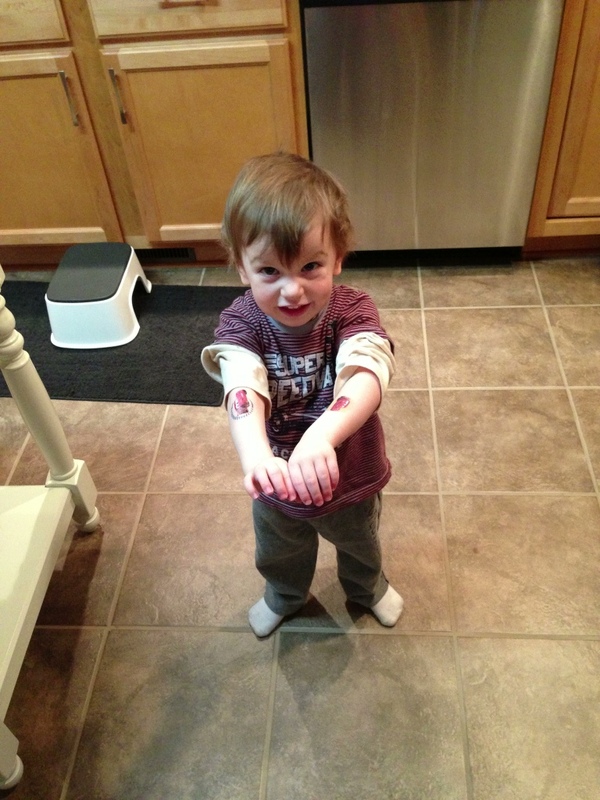 This entry was posted in Maximus, Milestones, Toddler and tagged potty training by Kyley Leger. Bookmark the permalink.